Playing Scrabble can be both fun and challenging. Sometimes you need a little bit of help to figure out how to make the most of your letters. Studying printable word lists and other helpful vocabulary resources can be a great way to come up with the ideas you need to make the most of each chance you have to lay down tiles and score points. Some letters are much harder to use than others. 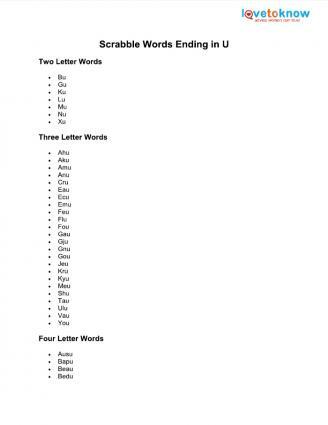 It can also be difficult to come up with word ideas if you have mostly vowels or mostly consonants to work with. This list can help you make the most of challenging letters or combinations of tiles. 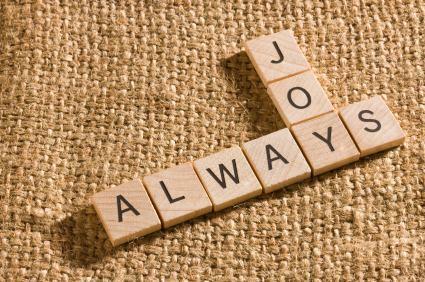 Words that end with the letter "U" are perfect for fitting into tough spots on a Scrabble board. Print this handy list before your next game so that you're prepared to make the most of any "U" tiles that you draw. Sometimes you just don't have the combinations of letters needed to put together a good word. Before you skip your turn, though, see if you can at least add one letter to something that's already on the board so that you are able to record some points. This list of two letter words might give you a few ideas. Highest Scoring Scrabble Words: This page features a variety of high scoring words organized by particular challenge. 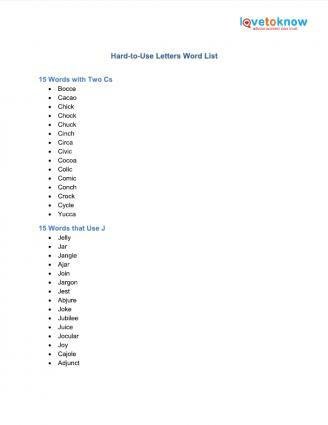 For example, the site features lists of words beginning with, ending with and containing specific letters. 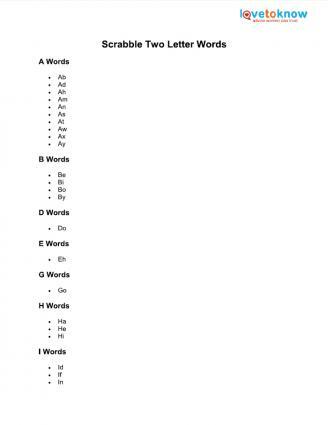 There are even lists of words containing two of a certain letter, as well as combinations for words that have a lot of vowels or even no vowels. Particular emphasis is placed on high point-value letters. The Phrontistery: This site has a great list of two-letter and three-letter Scrabble words. These shorter words can come in handy when you're playing since it's common to draw letter combinations that work with them. The site asserts that most expert-level players have memorized all of the two-letter words and many of the three-letter words. Hasbro.com: Hasbro, the maker of the original Scrabble game, offers a word list comprised of allowable two-letter Scrabble words. Your Dictionary Word Finder: This word finder includes a variety of word lists as well as a simple word-making function. Enter your Scrabble tiles to see which words can be made with your letters. This can be handy for playing around with different letter combinations to study which words will give you the most points. Worried that memorizing lists might give you an unfair advantage in your next Scrabble game? According to the National Scrabble Association Official Tournament Rules, memorization is legal. In fact, many tournament players memorize several word lists for competition. It is perfectly acceptable for you to do so as well. Building your vocabulary is a beneficial side effect of playing the game!